Each year I talk with longtime Scout.com Lady Vols reporter Maria M. Cornelius about the team’s upcoming season. As usual, her rich insights illuminate much about Tennessee’s players, staff and outlook for the year. The team hit a low last season when they fell out of the rankings for the first time in 31 years. Yet they ended the year on such a high, going to the Elite 8. Are they bottling that momentum going into this season? The preseason talk has centered on just that – keeping that momentum. The Lady Vols found their identity – really found themselves – in the postseason. It started in the regular season finale in Knoxville, a game in which Diamond DeShields finally just let go and played basketball, and then carried over into the NCAA tourney. 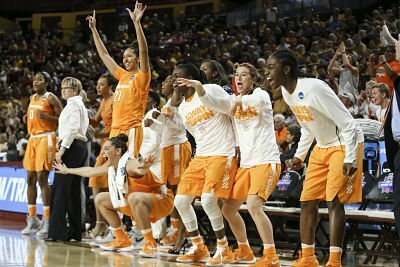 Without the concussion to Jordan Reynolds in the Sweet 16 game and injuries to Andraya Carter and Bashaara Graves – they played the Elite Eight with soft casts to try to protect broken bones – Tennessee had a much better chance of finally breaking through to the Final Four. Carter and Graves had grotesque finger injuries that essentially rendered them one-armed basketball players. 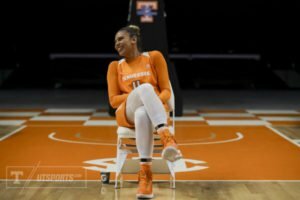 With a roster of just nine players, the Lady Vols simply can’t sustain any major injuries this season. There is no margin for error. Two of the nine – graduate transfer Schaquilla Nunn and freshman Kamera Harris – have never logged a minute in a Lady Vol uniform. Nunn has the benefit of significant college experience at Winthrop, but she has been off the court for a year to recover from a broken foot. Harris is a freshman playing the most physical position in college basketball. She can give them a few minutes a game – and she will have to – but a freshman center in the SEC needs time to adjust to the pace and the strength of her opponents. Head Coach Holly Warlick and Assistant Coach Jolette Law have both used the word “hungry” in preseason to describe the players. They do seem motivated. But it’s the toughest schedule in the country and four of the first five games are on the road, including perennial NCAA tourney team James Madison, and then East Tennessee State, Penn State and Virginia Tech. By mid-December, the Lady Vols will have played Baylor, Texas and Stanford. Then, it’s onto the rugged SEC and a mid-January visit by Notre Dame. The Lady Vols will learn a lot about themselves early. And, as they showed a year ago, they can fix it, even at the last minute. While they will take some hits with this schedule, they seem to have a better mind-set overall going into the season. A year ago, Tennessee was still somewhat adrift. DeShields was still ailing with her leg injury and struggled to get comfortable on the court. Carter’s knee pain was such that it ended her career after the 2015-16 season. The Lady Vols have a short roster and a stacked schedule. But Warlick has said in preseason that she is not having to coach effort. That alleviates a lot of issues for the coaching staff. Bashaara “the Beast” Graves is gone, as is floor leader Andraya Carter. 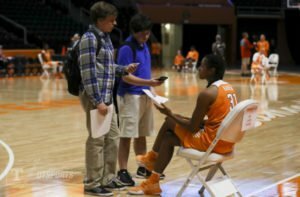 How are the Lady Vols replacing that energy on court and in practice? Those are two big losses. Graves was an absolute workhorse in the paint. Carter was able to settle the team down and set the tone on defense. Both players had a lot of big game experience. Jordan Reynolds said she is excited for the season. Photo by UT Athletics. The leadership this season has to come from point guard Jordan Reynolds. With Te’a Cooper out for the season with a knee injury, Reynolds, with assistance from Alexa Middleton and Meme Jackson, will have the ball in her hands. She has to lead the team on both ends. She has to be vocal, and she has to get the team organized. And she has to become a scorer – or at least a threat to score to occupy the defense. Reynolds is in tremendous shape – she shed more than 15 points over the summer and is leaner and noticeably fitter – and that is important because she will have to play a lot of minutes. Reynolds has shown what she can do over the past three years, but the output hasn’t been consistent. Warlick has praised her leadership throughout the preseason so that’s a very good sign. Reynolds also is a senior – and that sense of urgency seems to have kicked in for her well before the season starts. 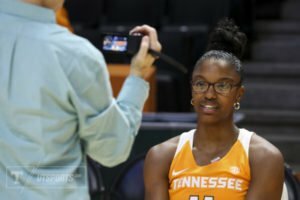 How are Diamond DeShields and Mercedes Russell looking going into the season? Do they have on-court chemistry? How are the other two returning starters, Jamie Nared and Jordan Reynolds, looking so far? DeShields and Russell both have been productive – which is good, because both have to be consistent scorers this season. Russell showed in postseason what she could do, especially the double-double against Ohio State. Tennessee needs that version of Russell every game. DeShields being healthy is key because she can create a shot anytime she wants to and has one of the smoothest jump shots in the game. Warlick has singled both of them out for having very good off-seasons. Jaime Nared answers questions for reporters at Tennessee media day. Photo by UT Athletics. Russell, Reynolds and Jaime Nared stayed in Knoxville all summer to work on their game. They made a pact to get better. And all three Oregon players are now in the starting lineup. Assistant Coach Dean Lockwood has repeatedly mentioned the effort of Nared over the summer because of the pace of her workouts and commitment. She didn’t just get in the gym and shoot. She had a plan for each session and went at game speed. Reynolds’ commitment showed in her conditioning transformation. She is going what a senior should – leading her team on the court and by example. Talk a little about the newcomers and what we can look for and expect from them this year. Schaquilla Nunn, who goes by Qui, is a graduate transfer from Winthrop. She broke her foot in practice a year ago and missed her senior season at the Rock Hill, South Carolina, school. 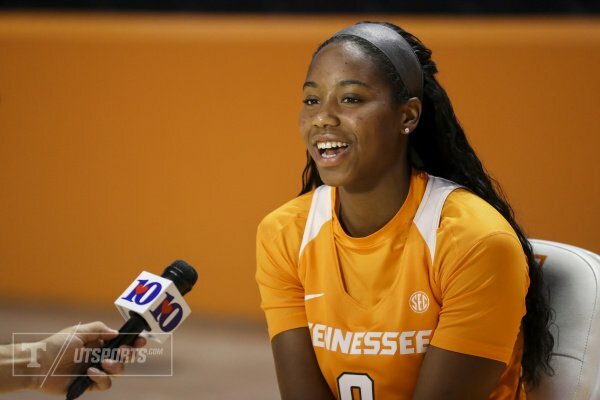 That ultimately made Nunn eligible to be a graduate transfer, and she chose Tennessee over Virginia Tech last spring. Nunn enrolled this summer and continued the rehab of her foot. She was released for workouts when the fall semester started and has impressed the coaches with her competitive maturity ever since. Schaquilla Nunn is a senior transfer forward. Photo by UT Athletics. Nunn does have experience at Thompson-Boling Arena. She tallied 12 points and 15 rebounds against Tennessee on Nov. 21, 2014, while in uniform for Winthrop. She is expected to be in the starting lineup on Monday for the exhibition game. Nunn is physical inside and will get on the glass. She also has been well received by her teammates and fit in very easily. Nunn’s presence means the defense can’t sag so much on Russell. Tennessee will always play inside-out, and Nunn and Russell could be a formidable duo in the paint. Kamera Harris is a true freshman, so she will need time to become an effective post player, but the coaches love her motor, resilience and effort. That will accelerate the learning process, but a freshman center has a steep adjustment in college, especially to the physicality of the game. Pat Summitt had Tye’sha Fluker on what she called a three-minute rule as a freshman. 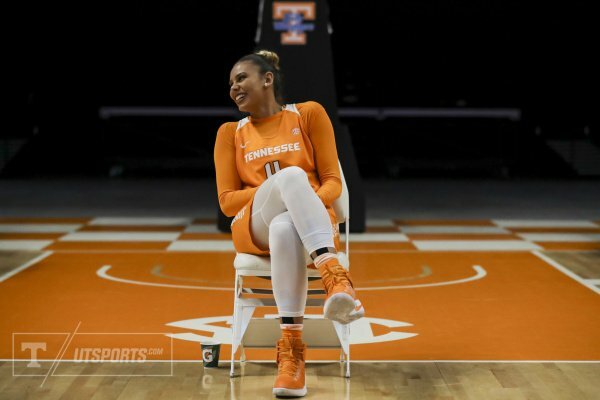 She asked Fluker, who would go on to become an excellent post player for Tennessee, to go as hard as she could and use those three minutes to be as effective as she could and then get a break on the bench. Harris is not ready for extended minutes, but she will have to provide some relief minutes for Russell and Nunn, especially if either get in foul trouble. It may be time to resurrect the Fluker rule. Have there been any practices that have stood out so far, for any particular reason? The biggest thing is Warlick having a stopwatch to time it. She has been very cognizant of not going over two hours a session. She knows the roster is short, and it’s a long haul from October to April. The Lady Vols also are spending quite a bit of time on offense. While Tennessee will always be a defensive-minded and rebounding team, the scoring woes of last season had to be corrected. There is a new assistant coach, of course, in Sharrona Reaves, who brings a new voice and perspective to the team. Law is very vocal, and Lockwood is his usual bundle of energy and enthusiasm. There also is a noticeable boost in overall effort. I don’t know if it’s because it’s early and the sessions are shorter. Maybe it’s the jolt from the newcomers and improved health overall team-wide. But the energy has been excellent. Of course, time will tell if that is sustained all season long. How has the death of Pat Summitt over the summer affected the team? The team saw the effect that Summitt had on the sport with the outpouring of tributes after her death. They also saw a parade of former Lady Vols fill the arena for Pat’s memorial service in Knoxville. They saw Lady Vol legends speak about Pat and her legacy and how she forever impacted their lives. They saw such luminaries as Candace Parker, Tamika Catchings and Chamique Holdsclaw. None of the current players played for Pat, though DeShields was recruited by her. But they see the banners. They see her name on the court. They know what Pat meant to the game. They also saw their head coach break down when Pat died. They know that Tennessee needs to reassert itself on a national stage. They don’t lack for motivation. There was a fan outcry when the team fell out of the rankings. Is that why Lady Vol players aren’t allowed on social media during the year now? That was started at the very end of 2015, so it wasn’t related to falling out of the rankings, which happened in February 2016. Warlick felt like the players spent too much time on it. They also were subjected to brutal commentary. She considered it a distraction and set Dec. 31, 2015, as the last day on social media last season until the season ended. This season, the moratorium started with the start of official practice. The players initially were in withdrawal, but several now say they don’t miss it and now realize how much time they spent on it. Does Holly Warlick set goals for the team? The Final Four is definitely a goal, always has been. The players also will write down their team and individual goals before the season begins, such as winning the SEC or averaging a certain number of rebounds. Warlick has emphasized the daily process this season – use every practice rep to get better. The focus seems to be very narrowed to what is happening at this moment. For a team that was adrift so much last season, that mooring is needed. This team has veterans, so that will help. Nunn, while new to Tennessee, is a seasoned player. DeShields has a lot to prove – both to herself and to the game. She had a very uneven season a year ago, and she seems more grounded and focused now. While the loss of Cooper is a tough one, it is better timing-wise for such an injury to happen over the summer than during the season. It gives Cooper a full year to heal, and Reynolds now knows that she has to take control of the team at the point guard position. Middleton and Kortney Dunbar are now juniors and veterans. Both will need to elevate their game this season and will get every opportunity to do so. Diamond DeShields is on video at Tennessee media day. Photo by UT Athletics. The true test will come when adversity strikes, though this team showed itself to be very resilient last season. Despite the struggles, no one quit, and no one transferred. That same resilience will be needed because every season has difficult stretches. How will team leaders DeShields and Reynolds react to adversity this season? Will they step up and steady the ship? Both seem to be much more willing to accept that role now. While DeShields and Russell will need to have All-SEC performances and carry a lot of the offensive load, Reynolds is key. She has the ball in her hands, and it’s her voice the team will need to hear. Warlick keeps saying how much she likes this team. If they stay together, stay healthy, stay hungry and keep working, this team could write quite a script.